Earlier this week I was trying to come up with a short term to use when referring to the "Overselling of the Microbiome" and related hype. And I came up with one I really really like: microbiomania. The term just captures the essence of hype about microbiomes to me I guess. So - of course - the first thing to do was to see if anyone else used this term. And the number one thing I looked at was domain names. Nope. Microbiomania.Com and Microbiomania.Org are now mine. And then I started to search the interwebs. And surprsingly there was not much (in English at least). But some links showed up to books in Google Books with passages from > 100 years ago. And this is when the digging got to be fun. Here are some of the things I found. 1. 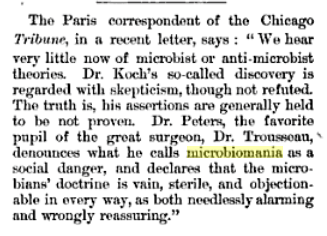 A section from "The Medical Era"
So I guess there were some folks who did not like the Koch and his silly theories about germs. Pretty awesome stuff I think. 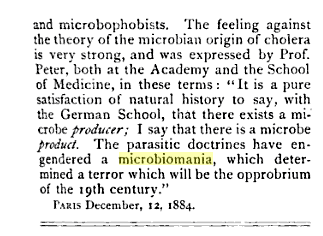 Microbophobia which I define here as the overwhelming and unreasonable fear of microbes (of any kinds). This is similar in concept to "germophobia" but gets around the issue some people have with whether "germ" is a term that should be reserved for pathogens and thus that germophobia could be viewed as the fear of pathogens. 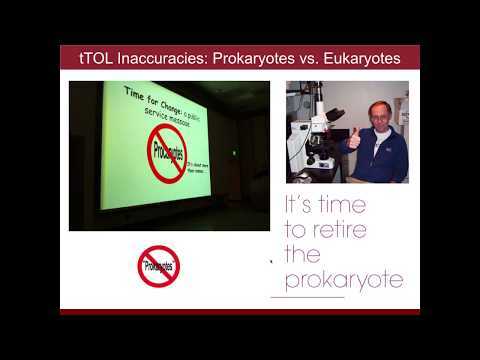 It is particularly important to view Koch's postulates in their proper rhetorical place; they were Koch's attempts to distinguish himself from other microbiologists, to force them to jump through a series of hoops before declaring that there was some new pathogen causing certain clinical manifestations. His intention was to reduce the discredit brought on infectious disease by minimally founded and unfounded claims. This whole story has been repeated with viruses (Virologists' Dilemma, Heubner 1957). There are probably other variations on the correlation vs disease causation theme as well. And now again with the microbiome we are encountering the correlation vs causation problem yet again. 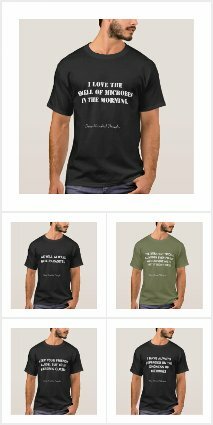 Thanks Christos -- I was trying to stick to what I saw in the Books coming up in searches ..